When most homeowners in Aledo hear the words “sewer repair,” they start to get worried. After all, don’t sewer repairs involve digging up the front yard, spending thousands of dollars, and being left having to landscape everything again. Fortunately, advances in technology mean that sewer repairs are easier than ever, especially when you work with the experts at Lightfoot. Let us take care of your sewer repair in Aledo TX so you don’t have to worry. When you call us for a sewer repair, one of our receptionists will connect you with a plumber in Aledo TX who has experience solving complex sewer problems. Our tech will arrive on time and really listen to everything you have to say about your plumbing issue. He or she will then examine the problem, even sending a camera down your sewer line if that’s what it takes. Finally, you will be informed immediately as to what is going on and what needs to be done to fix it. When your sewer has a problem, sometimes it is obvious. After all, if sewage is backing up into your home, you will know about it. Other times, though, your sewer may have a small issue that doesn’t cause a major problem. There are some things you can look for so you can catch these problems before they become major sewer issues. A bad smell. Do you smell rotten eggs or a general rotting smell? If you do, it may be time to check your sewer. Sewers dispose of waste, but that’s not all they do. They are also designed to keep the smelly sewer gases away from your home. When you begin to smell these gases, it’s a sure sign that something is going wrong in your sewer. Weird plumbing problems. When your washing machine drains, does your toilet overflow? Maybe your toilet gurgles every time your kitchen sink drains. These may seem unrelated, but they can be signs that there is a problem deep in your plumbing system, often in your sewer. We’ll come ferret out the issue and let you know how to get it fixed. All your drains clog at once. When one drain clogs, the problem is usually local. When multiple drains, all over the house, clog at once, though, it usually indicates some sort of problem with your sewer. There may be a major clog or even a leak that is causing some sort of backup. Either way, you’ll want to get it fixed before it becomes a major issue. No matter what your sewer issue is, we will use the latest technology to get it fixed. 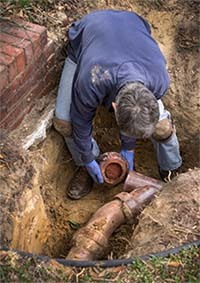 Gone are the days when plumbers had to dig a trench through the entire front yard to access your sewer line. Now, we can perform the repair from inside your home using remote controlled technology. Let us come show you how sewer repair in Aledo TX has changed now that technology has upgraded. You may be pleasantly surprised by how easy your repair is.